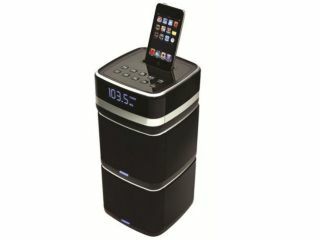 TechRadar readers can pick up an iPhone/Ipod dock for just £25 in the latest deal offered on the Tech Deals site. The i-Station Tower Micro Stereo Speaker System and Alarm Clock Radio has a novel design allowing it to be stacked to save space, or spread out in a more traditional fashion to make it a little more stereo-tastic. With the addition of App Control the unit also benefits from Internet Radio, Calendar, Event Reminders, Weather information. You can download the App for free from iTunes, and add additional functions including an Enhanced Alarm Clock with Sleep mode, Weather, Voice Message, Calendar, EQ Setting, Music Player, Nature Sounds, Photo Album, Slideshow and also features an Internet Radio and is My Music (Play Anywhere) ready. You can check out the deal at Tech Deals.